Annie's Gardening Corner: What’s Pinning Today? Cruising around the garden, it’s hard to imagine there is another underused perennial in the typical spring plantings. Wanting that instantaneous splash of color has many of us overlooking some spectacular perennials to use. Hellebores, this fetching plant is worth another peek. Though mentioned in past posts, don’t overlook this perennial during your yearly nursery rounds. 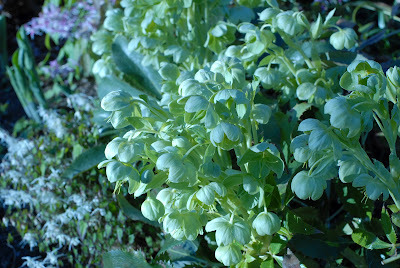 Add Hellebores to the top of the shopping list! Skim this link http://www.hellebores.org/growing/propagating.html to get your growing tips because once you plant this exceptional perennial, which did take high honors as the 2005 ‘Perennial Plant of the Year’, you’ll just fall heads over Hellebores in love with it. Henry Ward Beecher once stated, “Gratitude is the fairest blossom which springs from the soul.” So what shall be the fairest blossom which springs from our gardens? The underused perennials, like Epimediums and Hellebores. Make your spring plantings unique and add those lesser known’s to the top of your nursery shopping list! And if you’re wondering about today’s title, it was such fun to see the Pinterest in yesterday’s Epimedium shot. This whole pinning thing is new to me http://pinterest.com/bilowzassoc/ but here’s hoping that underused perennials get a better shake in the midst of the typical spring planting spread of Tulips and Daffodils. Although, don’t get me wrong. I still go daffy over spring bulbs in bloom, too!